ALM Evreux Basket (ProB) signed 32-year old American (has also Congolese passport) center Bambale Osby (203-113kg-86, college: Maryland, agency: Octagon Europe). He played last season at Maccabi Kiryat Motzkin in Israeli National League. Osby managed to play in three leagues in two countries last year. In 13 National League games he had 14.8ppg, 12.7rpg, 1.6apg, 1.0spg and 1.7bpg. He also played for TLU/Kalev (Alexela KML) in Latvian league where in 8 games he recorded 13.0ppg, 9.0rpg and 1.3apg. Osby also played 7 games in Baltic League where he averaged 10.3ppg, 9.7rpg and 1.0spg. The list of the past achievements is quite long as among others he won Baltic League championship title in 2014. Osby was also voted Eurobasket.com All-French ProB 3rd Team back in 2012. He is quite experienced player. Osby has played in eleven different countries on three different continents (Europe, Latin America and of course North America). 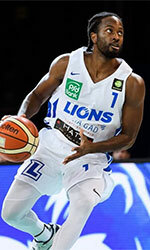 He has played previously professionally in Argentina (La Union), Austria (Gmunden Swans), Estonia, Germany, Greece, Lithuania (Siauliai), Puerto Rico (Vaqueros), Romania (Pitesti), Turkey (Afyon Bld and Socar Petkim), France (Aix Maurienne and Entente Orleans 45) and Latvia (TalTech). Osby is a former Eurobasket Summer League player, which is considered top international summer league on the market. He attended University of Maryland until 2008 and it will be his eleventh (!!!) season as a professional player.